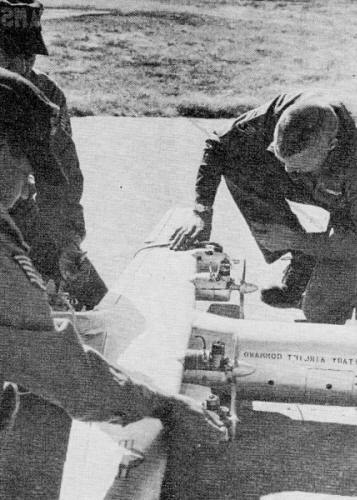 In 1970, when this article was written about USAF TSgt. 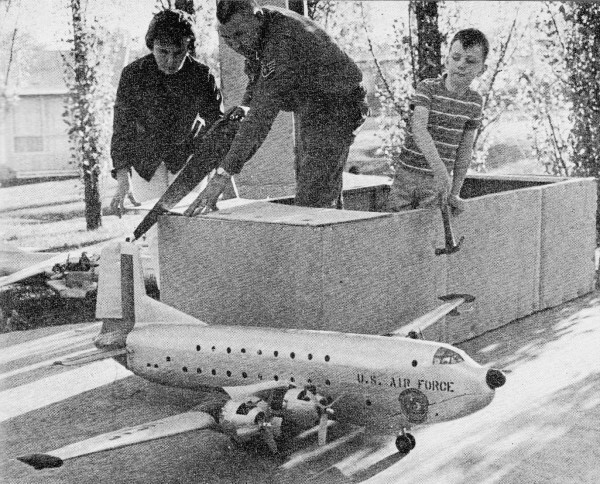 Gordon Ford's incredible collection of giant control line scale, multi-engined flying models, the KC-135 Stratotanker was still a decade from being replaced by the KC-10, the C-5A Galaxy was just coming online as the world's largest cargo aircraft, and the C-133 Cargomaster was about to be mothballed. 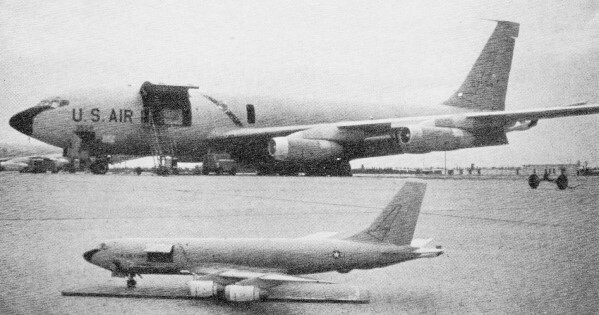 C-124 Globemasters were on their last legs, the XB-70 Valkyrie was a bygone dream, and the Convair T-29 (C-131) only had a few good years left in her. These are just a few of the aircraft in SSgt. Ford's hangar. Here is a rare treat. MSgt. 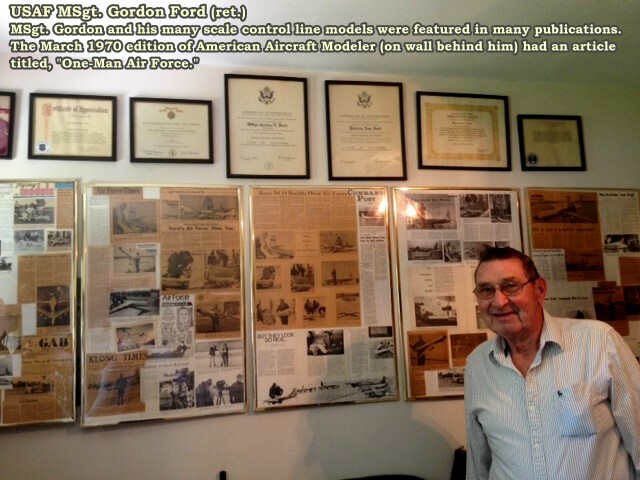 Gordon Ford's daughter contacted me after seeing this article on her father's models! She told me he is now living in Minnesota and still has most of the models that he so expertly built over the years. Come to find out, American Aircraft Modeler was not the only publication that featured his handiwork. Click on the thumbnail images to see where the C-133 and the KC-135 are now. I can't imagine being able to preserve any model that was actually flown often for that long. Many thanks to MSgt. Ford for his service to the country and for his service to the aeromodeling sport. Thanks also to his daughter for checking in with an update. How he was able to transport all these humongous models from base-to-base is hard to imagine. I know from my short tenure in the USAF (4 years) that the allowance given for transporting personal effects is not very large, and that you have to pay for anything over the basic amount. My guess is that the good sergeant's job as an aircraft mechanic might have provided for a little horse trading of favors with a few loadmasters around the world, who would have been able to make a little extra room in one of those cargo planes for his plywood crates. Does anyone out there know what has become of TSgt. Ford or his fine models (see insert to the left)? 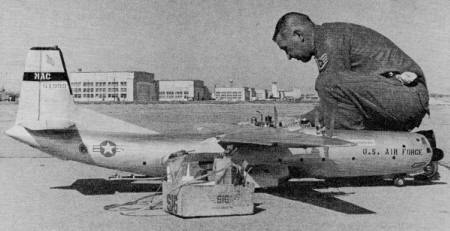 Technical Sergeant Gordon E. Ford, United States Air Force, just loves these scratch-built giant scale birds. Putting his Convair T-29 through its paces with real-life sistership in background is Tech. Sgt. Ford. Convair spans 4 ft., has two 19's. Technical Sergeant Gordon E. Ford, 95th Consolidated Aircraft Maintenance Squadron, Goose Air Base, Canada, is a reciprocal engine mechanic. Off duty, he maintains his own private "Air Force." Sergeant Ford's air force is not the dime-store variety, nor quite large enough to move an army. It is a large collection of model aircraft that he built to scale using military tech orders and converting feet to inches and centimeters. 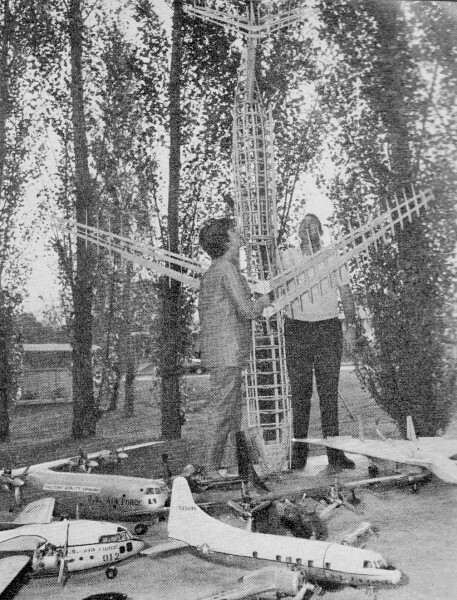 Those who have assembled a model from a kit can imagine the many difficulties encountered when constructing massive scale-model airplanes from scratch. Sergeant Ford's production has outgrown the "hobby" stage. He hand-makes all the wooden parts, including most of the propellers. He has built many such models, and presently has 17 planes in flying shape. The most impressive at the moment is the KC-135 refueling aircraft. 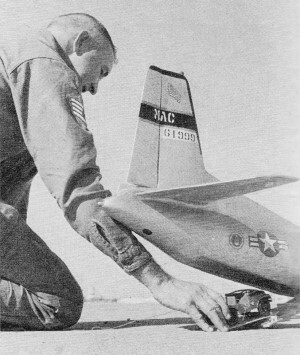 It won him second place in a model aircraft competition last July at Lackland AFB, Texas. The aircraft carries two quarts of fuel, has an operable boom that off-loads fuel in flight. It can stay aloft for one hour, or nearly 50 miles. Boeing KC-135 jet-tanker is authentic, even to markings on the fin. Tanker spans 5 1/2 ft., power unknown. Sergeant Ford's entry was defeated at the Lackland competition by a Fokker, owned by TSgt. Burt Dugan whose home base was Lackland. Ford feels that, for competition purposes of that type, the older the aircraft and the more details, the better the chance of winning. Transporting his fleet during station changes is a big problem in logistics. Here, the family puzzles crating a 7 ft. 3 in. Globemaster. It has two 35's, two 19's. Ford's flight line and hangars are his back yard and basement, as well as nearly every room in the house. Models hang from ceilings in the living room, dining room and bedrooms. From Mrs. Ford's viewpoint, it makes an interesting topic of conversation at parties. It must take a lot of patience, pride and humor to contend with such a hobby, and Mrs. Ford deserves a medal for it, according to her husband. 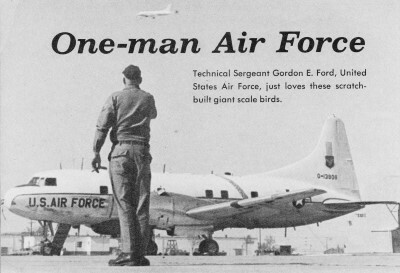 When Mrs. Ford married her "Air Force" man, he had built only one airplane, but after watching him at work many nights she decided, "If you can't fight them, join them," and join them she did. To date, Mrs. Ford has built and flown three airplanes and enjoys helping him with the big ones. She said, "It's really an exciting experience and I think I am more excited than he is when a new model lifts off." 10 1/2 ft. Lockheed C-5A seems to grow as tall as the trees. Following Ford's standard 1/24th scale, it will have two Max 58's and two SuperTigre 56's. The 12-lb. B-70 has two pusher 60's. At present, Sergeant Ford is building a C5-A Galaxie. This model will be 10 1/2' long, 9 1/2' wide, 32 1/2" high, and will have its landing gear raised and lowered by radio control. The giant model will be powered by two Supertigre 56 and two Max 58 engines with throttles. It will have four-bladed propellers on each engine, and throttles will be controlled from one main point. The motors put out approximately five horsepower. His future projects include a Ford Tri-motor - a three-engine cargo aircraft, originally built around 1925 and dubbed the "Tin Goose." Also planned is an eventual in-flight refueling between two model aircraft. Ford has been building model aircraft for 23 years. He has had a lot of fun with them, met lots of interesting folks and exchanged correspondence with people all over the world. Getting some of the letters translated was a problem. He has even sent some to the embassies concerned whenever someone on base could not be located to translate them for him. In many cases, servicemen with wives from Germany, France, Japan, and Holland have assisted him. A major problem that must be considered when building models of this sort is their transportation from base to base. He built his planes with detachable wings. The bigger models even divide in the middle for easier packing. The first Wright Brothers' airplane had 12 horsepower, carried one gallon of fuel and flew just a little over 100 feet. Sergeant Ford's C5-A will have five horsepower, carry two gallons of fuel and will be able to fly approximately 50 mph, and stay airborne more than an hour. Ford prepares to start an outboard 19. Inboard engines are 35's.